Two massive ships are on a dual path to destruction. One is a freighter carrying nuclear materials to Japan; the other, a cruise ship heading for the Mediterranean. Neither will reach their destinations. 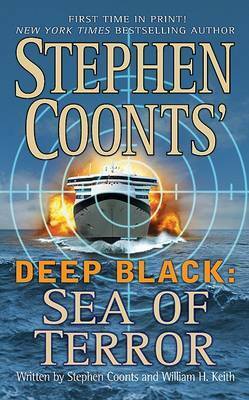 Two factions Japanese eco-terrorists and Middle East extremists have joined forces to infiltrate the ships, incapacitate the crew, and change course toward a common target: The United States of America.In Washington, Charlie Dean and a team of commandos are dispatched on a life-or-death mission to blow the hijackers' plot out of the water. Their plan: board the ship unnoticed, pose as ordinary passengers, and overtake the terrorists. But time is running out. The seized ships are crossing the Atlantic with the combined strength of a full-scale nuclear torpedo. And New York City is just on the horizon. " As a naval aviator, STEPHEN COONTS flew combat missions during the Vietnam War. A former attorney and the author of fifteen" New York Times "bestsellers, he and his wife reside in Colorado. "Deep Black "co-author William H. Keith has written nearly eighty books over the past twenty-five years. His novels, published under the pseudonyms Ian Douglas and H. Jay Riker, are geopolitical thrillers with an emphasis on the Marines and submarine warfare. A veteran of the Navy, he lives in western Pennsylvania.